In 2008, 74-year old Pete Kenyon was diagnosed with lung cancer. In 2016, he was diagnosed with a second cancer in the same lung. This is his story. After more than 40 years at the Crofton Pulp and Paper Mill, Pete retired at age 62. In his retirement, he played golf three-to-four times a week and travelled with his wife Doris to Mexico, Palm Desert and England. In December 2008, he caught a bug on an airplane. His family doctor, Dr. Murray Woods, suspected pneumonia. When Pete showed only mild improvement after a second dose of antibiotics, Dr. Woods sent him for a CAT scan. The results revealed multiple nodes at the top of Pete’s left lung. He was sent to Vancouver for a PET scan, which confirmed the growths were cancerous. He was referred to Dr. John Samphire, a thoracic surgeon at Royal Jubilee Hospital in Victoria. Thoracic surgeons specialize mainly in the chest, including its tissues and lymph nodes, the trachea, esophagus, lungs, chest wall and diaphragm. The majority of patients they treat are over the age of 40 with 80% diagnosed or treated for cancer. 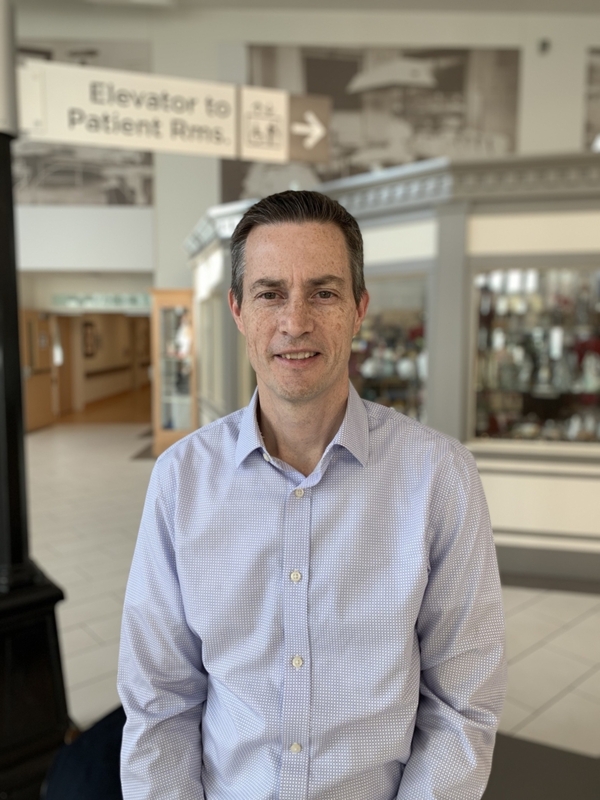 Now in his 15th year of practice, Dr. Samphire chose Victoria because Royal Jubilee Hospital was newly established as a BC Center for Excellence in Thoracic Surgery — the only hospital on Vancouver Island to offer this surgical service. In April, Pete underwent a lobectomy. He lost the top 50% of his left lung and nearby lymph nodes. “I was on edge,” he says. Post-operation, he had a 50% chance of being cancer free in five years. From June through September, Pete received chemotherapy at Cowichan District Hospital. He visited Dr. Samphire for check-ups for a period of four years. Gradually, over the course of a year, Pete recovered. As he healed, he regained his strength for golf, gardening, and house repairs. Eight years later, at 82, Pete was diagnosed with cancer again. In 2016, Dr. Michele Ismael performed Pete’s annual physical exam. Afterward, she asked how he was feeling and if he had noticed anything out of the ordinary in his body or routine. Pete remembers the quick but pivotal exchange: “I said, ‘As a matter of fact, the last three months I’ve had night sweats.’” Dr. Ismael immediately referred him for a CAT scan. Later that day, he got the call to return to her office the next morning. The CAT scan image revealed that at the bottom of the left lung was a growth in the shape of a perfect figure-eight. When this growth was confirmed as cancerous, Pete returned to Dr. Samphire. An internal thoracic video system allows thoracic surgeons to operate through a tiny hole in the interior of the chest cavity — useful for the diagnosis, staging, treatment, and monitoring of various cancers along with other conditions specific to the area, such as inflammation and abnormal growths — advancing care for the almost 700 patients who undergo thoracic surgery each year at Royal Jubilee Hospital. The internal thoracic video system includes a mediastinoscope with a built-in camera that provides the clinician with extraordinary visualization, even in challenging areas, while also recording the procedure for post-surgery analysis. Additional attachments allow the mediastinoscope to obtain tissue samples for biopsy of lymph nodes. With greater accuracy and detail, this equipment improves a surgeon’s confidence and reduces complications related to bleeding and nerve damage. A thorough teaching tool, the screen allows less experienced surgeons to assist and scrub nurses to take part in the process — they observe what’s happening, are more involved in the procedure, and can better anticipate needs. As part of their $3.5 million You Are Vital campaign, the Victoria Hospitals Foundation is asking the community to help raise funds for the purchase of a new internal thoracic video system. When Dr. Samphire started his practice, thoracic surgeons didn’t operate often on people over the age of 80, but with the advent of video-assisted minimal access surgery, the range of delivery, who is eligible for a procedure, has expanded. For Pete’s second operation, Dr. Samphire performed minimal access surgery. Through small key-hole incisions on the side of the chest, Dr. Samphire was able to operate below scars from the first surgery, and removed the growth while observing his work on the screen. The minimally invasive key-hole procedure allowed for a smoother and quicker recovery than the open surgery ten years before — and, this time, without the need for chemotherapy. In the weeks following his procedure, Pete gradually healed, returned to golf and cutting his grass, and has been doing well ever since. Pete and Doris continue to visit family: three children, eight grandchildren, and five — soon to be six — great grandchildren!